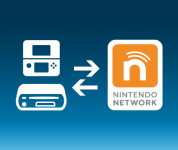 Nintendo systems offer a variety of features that take advantage of online connectivity. Your child can interact with their friends, play multiplayer games over the internet, share experiences with other gamers and more! Take a look around to find out more about the online functions of our systems.